Season chicken liberally with salt and pepper. 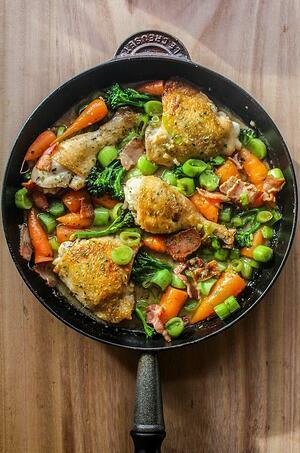 In a large, heavy-bottomed saucepan, heat 2 tablespoons oil and quickly brown chicken over high heat. Remove and set aside. Add mushrooms, onion, garlic, carrots, and celery and sauté until very lightly browned. Return chicken to pan and add wine, tomatoes, thyme, sage, and the stock and bring to a simmer. Cover and simmer until chicken is tender, 25 to 30 minutes. Remove chicken and cut meat into bite sized slices and set aside. Strain braising liquid reserving vegetables and return liquid to pot. Bring to a boil and cook over high heat for 8 to 10 minutes to reduce and thicken lightly. This also concentrates the flavors. Taste and adjust seasoning with salt, pepper, and drops of balsamic vinegar if using. Add reserved meat and vegetables and heat through. Stir in parsley and keep warm. Meanwhile, bring a large pot of water to a boil, add salt to taste and pasta. Cook pasta until just tender, drain, and toss with chopped basil and sun-dried tomatoes. Place pasta in center of warm, large flat pasta bowls and ladle braised chicken sauce around. Garnish with basil springs and shaved cheese and serve immediately. Submit Your Recipe to Collingtonsocial@gmail.com to be showcased in our "My Favorite Recipes" feature in our monthly newsletter.